Havarie. Dir. Philip Scheffner. Real Fiction Filmverleih, 2016. Goethe-Institut San Francisco presents a reading with Merle Kröger (Radio Bremen Crime Novel Award 2015 / German Crime Novel Award 2016) and a film screening with Philip Scheffner in collaboration with the Litquake Festival and the Center for the Art of Translation. It’s spring break, so no Forum lab today. Still, that’s no excuse to neglect y’all! An evening of progressive poetry, spoken word and vocal performances for social justice. 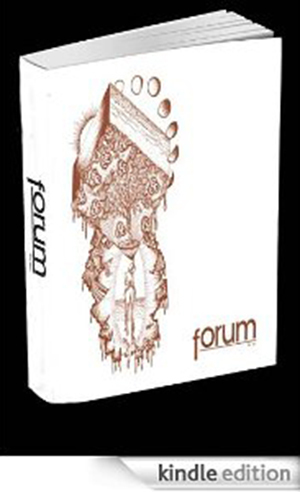 Una noche de poesía, palabra oral y expresión creativa. 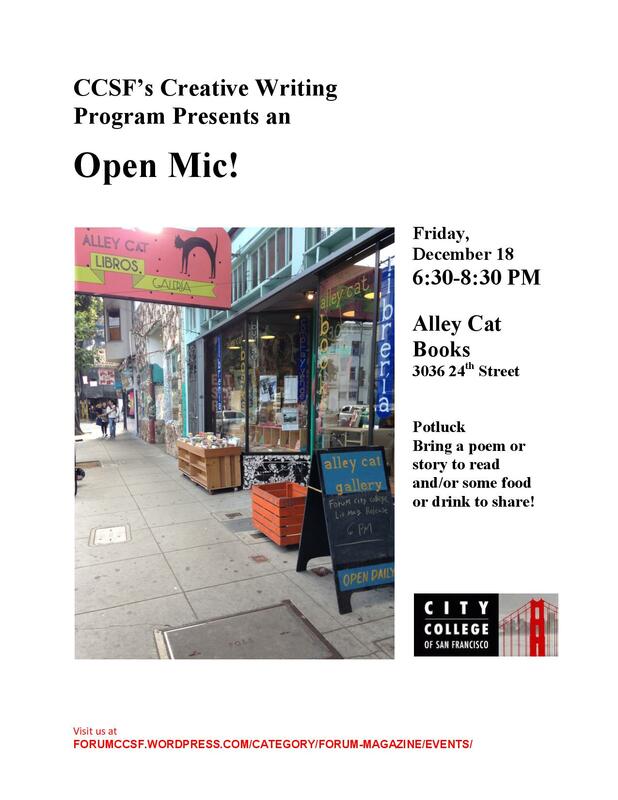 Come to our Open Mic at Alley Cat Books! Two of CCSF’s Creative Writing faculty, Xochiquetzal Candelaria and Jen Sullivan Brych, will be reading at Litquake events this week! 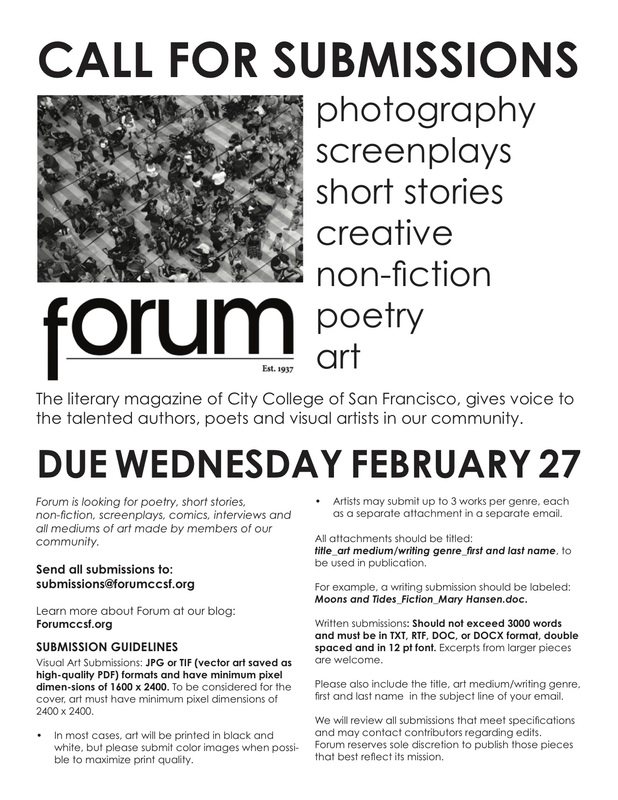 Where: Mission Cultural Center; 2868 Mission St. Description: Artists widen the scope of time capturing and releasing a moment. Hear this group talk about creating art that persists and emboldens in this era of displacement. Includes screening of Anatomy of a Mural, Rick Goldsmith’s 15-minute film about the creation of the Mission Cultural Center’s mural. Donations accepted at the door. Where: Adobe Books; 3130 24th St. Description: anthology presents a collection of inspiring, compelling, humorous, and beautifully crafted poetry and fiction for those hungry for striking language and captivating voices.